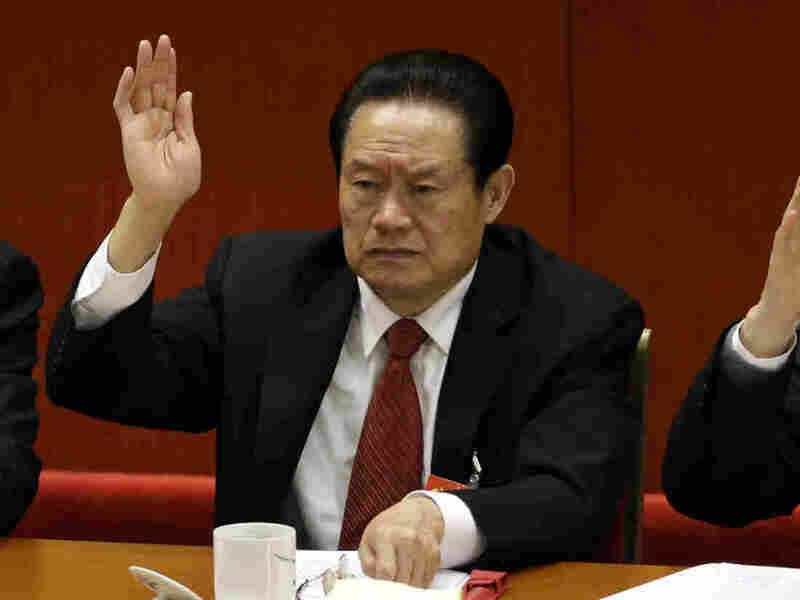 China's Ex-Security Chief Arrested On Corruption Charges : The Two-Way Zhou Yongkang, a senior Communist Party official who retired in 2012, has been under investigation for bribery for months. A 2012 photo of Zhou Yongkang, the then-Chinese Communist Party Politburo Standing Committee member in charge of security. Zhou has been arrested on charges of corruption and leaking state secrets. A former Chinese domestic security chief has been arrested and expelled from the Communist Party on charges of bribery and leaking state secrets. Zhou Yongkang, who has been under investigation for months, becomes the highest-ranking leader to become ensnared in the country's high-profile crackdown on corruption. The net around the 71-year-old Zhou — who controlled the police, security and intelligence services before his retirement in 2012 — had been tightening in recent months, with family members and former subordinates detained on suspicion of corruption, "raising expectations that Zhou would soon fall, as well," NPR's Anthony Kuhn reported back in July. Zhou, who rose up the Communist Party ranks as a key figure in the country's oil-and-gas industry, was the most senior of nine leaders to fall under investigation. At the time, the official People's Daily newspaper noted in an editorial that Zhou's case sent a clear signal that no Communist Party official was above the law. A statement released by Xihnua at midnight said, "the party's elite decision-making politburo said that Zhou's case had been handed over to judicial authorities, setting the stage for his trial," according to Reuters. In June, Chinese President Xi Jinping reportedly told a closed-door meeting of the Politburo that "The two armies of corruption and anti-corruption are at a stalemate. "In my struggle against corruption, I don't care about life or death, or ruining my reputation," a state-run newspaper in northeast China quoted him as saying. In a possible foreshadowing of Zhou's ultimate fate, last year flamboyant regional politician Bo Xilai was given a life sentence on charges of bribery, embezzlement and abuse of power. Bo was considered a close ally of Zhou's.